Also we see your in Charleston SC. Welcome to the USA! We bought our boat there 5 years ago and then eventually ended up in St. Petersburg FL on the Gulf Coast. Not sure how long your staying in the Charleston area but if you are needing a different marina we would Highly recommend Tolers Cove Marina. They are located on the east side of the Charleston Harbor entrance just before the Ben Sawyer bridge on the Intracoastal Waterway. If you go there tell them the Red Sailboat Seacilia says Hi. Another tip incase you haven’t already found it is the “Active Captain” website and APP. It’s free and is an invaluable tool for cruising. Thanks so much for commenting. We have only been in Charleston for 24 hours but are loving the change of pace and atmosphere compared to the Caribbean and Bahamas! Thanks for the recommendations! I haven’t been following your adventures for too long, but I love following along on your journey. Do you have a tentative plan for your USA sailing? Any plans for the Texas coastline — Corpus Christi? You two remind me of my students! They are a wonderful group. Faculity.mc3.edu//ttucker/ttuck.htm…….I am working on an old schooner and retiring in less than a year…you two have been a great inspiration to me. Keep having fun! Maybe I’ll see you out there. the end of the adventure (hope not), or your getting a bigger boat? I read that you guys used to watch Distant Shores to get you through the times when your plans and dreams of setting sail on a new life of adventure seemed a lifetime away from your London life. You guys are my Distant Shores. 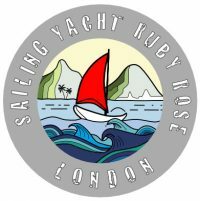 We are planning now to set off on our circumnavigation in two years time and your blogs and videos are keeping me sane and focussed on what needs to be done before we head off. So please keep them coming, especially through the dark winter months back here in Blighty. 28 m above sea level? Are you on a foiling sailboat? Looks like a great crossing to Bermuda. Going along at a nice 5 to 6 knots.